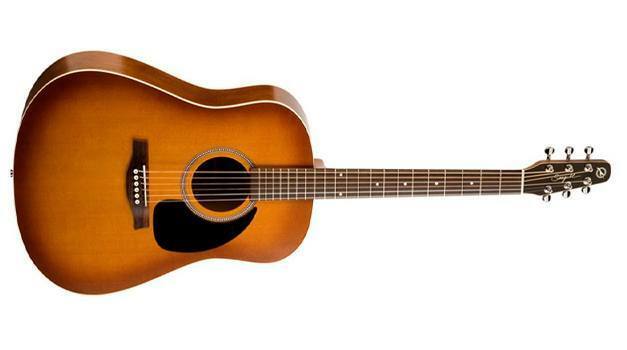 The Seagull Entourage Rustic guitar is a classic acoustic design by the popular North American manufacturer Seagull that uses simplicity and class to make something wholly new out of something old. The S6 line has been a staple of acoustic guitar manufacturing since its introduction more than fifteen years ago. Seagull is a relatively new company in comparison to Gibson, Fender and the other big names, but they quickly became renowned for their spectacular builds, and the new Seagull Entourage line is nothing short of matching and even surpassing the quality musicians have come to expect out of Seagull. The body has a very solid feel, and the woods are definitely more selective than those used on acoustics in similar price ranges. The problem with most wild cherry bodied guitars is that the cherry used is typically cheap, and has a dull, “plasticky” feel to it, reminiscent of cheaply laminated plywood. Fortunately, the wild cherry used in making the Entourage Rustic is of a much higher caliber. The wood has a wonderful, if a bit fragile feel to it. The only problem is the semi-gloss finish; for some, it might be lathered on a bit too thickly, as it does have a slightly false feel to it. Again, as proof of how well Seagull thinks out their choices, even if they won’t satisfy every taste, the gloss fortunately makes little to no impact on the tone of the instrument. Entourage guitars have always had that distinct, comforting “Seagull” feel to them. They tend to play and feel like a guitar $500 more expensive. The Entourage Rustic is no exception. If there is one thing Seagull knows how to do better than most manufacturers, it is to offer a guitar at a budget price that will last, and feel great its entire lifetime. The neck is thin and made for small to medium sized hands, and the set neck makes for great fret access up to the 16th fret–which, for an acoustic, is more than most expect. Seagull guitars have a bright, beautiful sound. Tonally, most who play a Seagull can tell another Seagull by ear from a mile away. As a line, the guitars are pleasing and wonderful to hear, so long as you prefer brighter sounding guitars. The Entourage Rustic is definitely a bright instrument–it has more treble than it does bass, which means that each note clarifies itself and chords have a vibrant, enthusiastic feel to them, lending even the simplest of songs enough power to make them heard. If you are looking for a darker sounding guitar, with more bass, it might be best to look elsewhere.